During my six years as Africa correspondent for a Swedish daily newspaper I travelled the African continent to report on news, often jumping from one crisis spot to another. It’s a harsh world many times, and the news media is often blamed for presenting a one-sided negative image of Africa. News is news though, the purpose of which is to draw attention to the problems and questions of our common world. There is never just one side to a story though. I come from a home in rural Sweden where food has always been at the centre of family life: be it growing vegetables, rearing domestic animals or cooking up a feast. As I travelled Africa for news I often stopped along the way to check out what was offered at the village market or on the supermarket shelves in cities like Kigali and Abidjan. I ate in fancy restaurants and tasted local fare at street stalls. 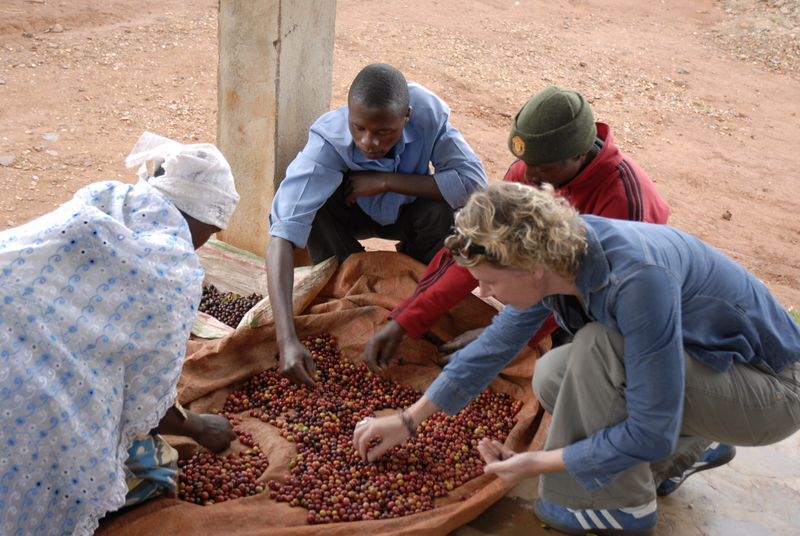 Checking coffee beans in Muhazi region, Rwanda. I chatted to cooks, and asked for recipes and cooking tips where possible. For me, it was a way to check in with daily life: to share in a bit of normality in what were often difficult environments. And to learn about Africa. The continent is a gigantic mosaic of cultural, economic, lingustic, social, political and culinary realities. What and how we eat says a lot about who we are. Food also often reveal how similar we all are, even if the environments we live in vary widely. To offer somebody something to eat is to offer a bit of yourself. If there is one thing that I found is universal on the continent it is a generous hospitality. I have shared popcorn with refugees at a wedding feast in Chad, palm wine with Nigerian delta rebels, and ghost stories around a camp fire meal in Madagascar’s rain forrest. This blog is an attempt to share some of my experiences on the side of the road, to share a different side of Africa than the one I reported on as a journalist. 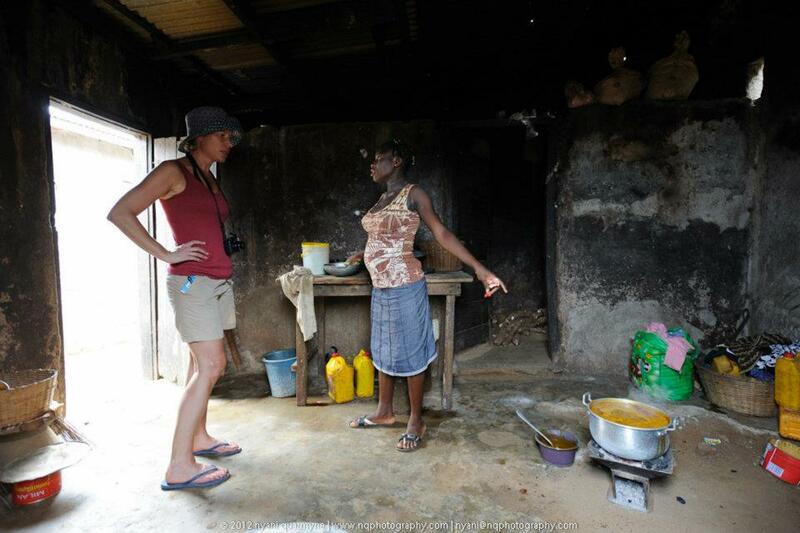 Chatting palm nut soup with Princess in Ampenyi, Ghana. My own recipes are not traditionally African. The art of the traditional cuisine is best communicated by those who grew up next to their mother’s and grandmother’s pots, and who know the tastes and smells and textures of African dishes as well as they know how to walk and talk. My recipes are rather inspired by Africa, by the Africa I meet. For those readers who are not familiar with Africa though, I hope they might awaken a curiosity also of the traditional art of African cooking. I might stray at times. I might even share some Swedish recipes. I’m a cook book junkie and will post some book reviews. I love living in Joburg and sometimes dine out, so I aim to share som restaurant tips too. I hope to entertain and inspire both African and foreign readers. I also wish to connect with other likeminded bloggers out there, to meet new friends on my culinary African journey. 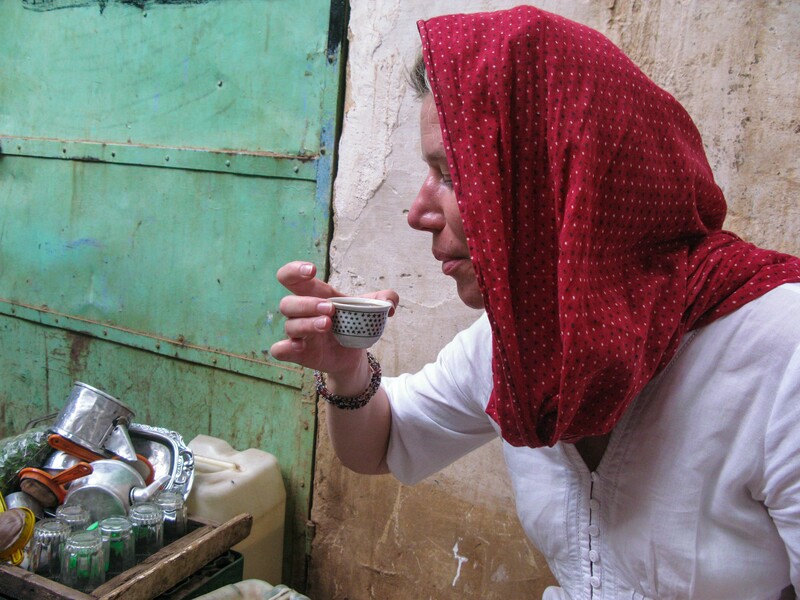 Drinking coffee in Omdurman, Sudan. There’s an African proverb that says that an elephant is best eaten bite by bite; that big projects are best undertaken step by step. Africa is the birthplace of humanity and the vast home of one billion people. It stretches from jollof rice in the West to nyama choma in the East, from preserved lemons in the North to pap and voers in the South. It isn’t a place you can taste in a single dish. It is a place you need to explore bite by bite. Looking very much forward to following. Great project! Good day africanbite. im struggling to find nigerian food in cape town. Do you know if anyone can assist me? Hi Jenay, sadly I don’t know any Nigerian restaurants in Cape Town – but if I hear of one I’ll let you know! I love this Anna, keep it coming! Great blogg! Could be an lovely book! Thank you – so glad to hear that! Thanks Adam! Promise to cook for you and Rosie one day.